There are many ways to generate traffic to your website. I had always taught my students to use at least one paid and one free traffic method. If I only have time to do one free traffic method, that it is going to be article marketing. This means that I will write articles and use them to promote my websites. Article marketing is one of the easiest free traffic method. Remember that content is the king on the internet and people are always demanding for content. However, please provide quality content so that your readers will benefit from it and go to your website again and again. So how does article marketing works? Let’s go over a broad overview of the basics. Article marketing refers to the writing of article and then distributing it on the internet with a link back to your website. It actually involves a bit of branding, SEO and content syndication. The content itself is very important and if you are able to write well and do it correctly, it can help to consistently bring traffic to your website for a long time. One of my coaches had written more than a thousand articles many years ago and today, these articles are still bringing traffic to his website! In addition, if your website is a content website such as a blog, it will be getting more backlinks and it helps in the ranking in search engines. When people keep seeing your content on different sites, you are also starting to build your brand and reputation. So why do you want to put articles on other people’s sites in the first place? When you first started out, your website is probably very new and do not have much content and reputation. They are also not going to be ranked in the first few pages of the search engines. Putting your articles on other people’s sites and then linking back to your own website can leverage on the site’s traffic. In addition, you are also building backlinks in the process which slowly help to increase the ranking of your website. Ultimately, you want visitors to visit your website. So when someone reads the article on other people’s site and find that your content or idea is interesting, he may be enticed to visit your website. So after reading the article, he will click on the link that you had provided earlier and visit your website! In order to do this, start of with finding your keywords and include them in your title. The keyword should also be carefully chosen in order to maximize search engine traffic. Next, start writing the article. Do your research and write at least 400 words. But please do not write too long as most readers on the internet do not like lengthy content. The attention span is reducing every second he spends reading the article. When your article is done, start approaching other sites’s owners. Propose to them that you like to contribute to their website content. Do take note that you should preferably find sites that are in the same niche as your website. So that the traffic that goes to your website are already interested in your niche. Once they accept your request, you can send them the article and remember to include a link back to your website. 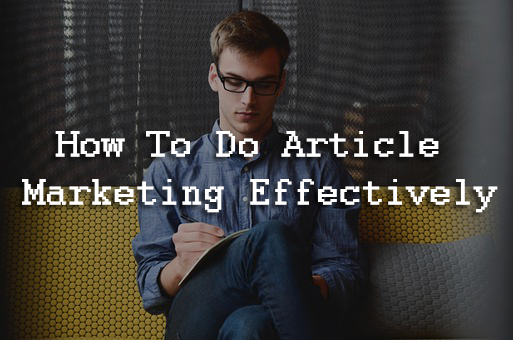 Do this consistently and you will be able to reap the benefit of article marketing.